This website design Kilkenny project completed a hat-trick for us, as it was the third of three we were commissioned to build for the same client, Kavanagh Engineering based in Thomastown, Co Kilkenny. This site was to showcase a series of Shopping Trolley Systems offered by the client, aimed mainly at supermarkets at other large stores where shopping trolleys are used. The systems are highly effective, and genius in their simplicity – being based around an intelligent trolley wheel that locks if somebody attempts to push that trolley out without first passing through a designated security point such as a check-out. The client had already installed such Shopping Trolley Systems at branches of all major supermarket groups in Ireland, and wanted a website to bring details of their benefits to others. We got to work. Working in close consultation with the client, we learned that the cost of trolley push-out theft in Ireland runs into many million euro each year, and that many supermarkets are crying out for a system to tackle it. 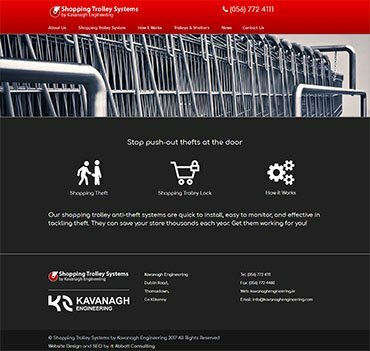 The Shopping Trolley Systems offered by Kavanagh Engineering are the ideal solution, so we devised a plan for a website that would see it rank highly for key terms, to bring the systems to the attention of the relevant decision-makers. Our senior copywriter produced SEO-optimised content, and sent it to the client for approval. Once we got the go-ahead, we moved on to the design and build itself. Another common factor is how all our customary SEO services were performed at each stage of the build, including site map construction, meta tag and URL optimisation, and much more. Separate sections were provided for associated services also offered by the client, such as supply of shopping trolleys themselves, and shopping trolley shelters. Overall, the new site has the same sleek style as the others we built for the client, is equally easy to navigate, and is equally responsive for screens of all sizes. Visit www.shoppingtrolleysystems.ie to see the results of our work.